Well, I just passed the halfway point of the 48-Hour Book Challenge and things are going well. So far, I have finished 3 books and started a fourth, and I've spent 12.5 hours reading, which puts me a little farther than halfway towards my goal of 24 hours reading this weekend. So, I'm feeling good about being able to meet my goal by this time tomorrow! Listening to an audiobook has REALLY helped. Since I've got Audible on my iPhone (so high-tech), I can switch on my audiobook any time I take a little break to, say, fix lunch or unload the dishwasher. Not only do those little increments add up in my time count (I believe I've listened to 1.5 hours so far in the challenge), but it provides a nice rest for my eyes and a little change of pace. Of course, it helps that I love audiobooks anyway and I am enjoying my chosen title (Lockdown by Walter Dean Myers). I've really enjoyed Tweeting with everyone and checking people's blogs for updates, too! That provides a nice change of pace, as well, and it's so great to get (and leave!) encouraging comments! I'm glad I didn't set a goal for number of books this year because I've been reading some longer novels and more YA and adult than in years past, so the reading is going slower. 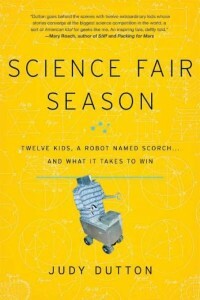 Currently reading: Science Fair Season: Twelve Kids, A Robot Named Scorch... And What it Takes to Win by Judy Dutton. I'm really enjoying it and a little nonfiction is a nice change from novels! How's the challenge going for you? 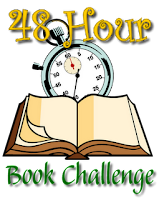 If you're not participating in the challenge this weekend, are you reading anything anyway?